CALVIN Harris today topped a Forbes list of the world's highest paid DJs, earning an estimated $66 million in an annual payday that surpassed "Hunger Games" actress Jennifer Lawrence and reflected the explosion of electronic dance music (EDM). Harris, 31, a record producer who has worked with the likes of Rihanna and Ne-Yo, saw his 2014 album "Motion" debut at the top of the U.S. dance charts. He is also the face of Giorgio Armani's underwear, eye wear and watch lines, and is currently dating pop star Taylor Swift. Harris's estimated haul of $66 million from his music work and endorsements earned him more money than Oscar-winning actress Lawrence, who last week topped Forbes' list of the world's highest paid actresses with $52 million. 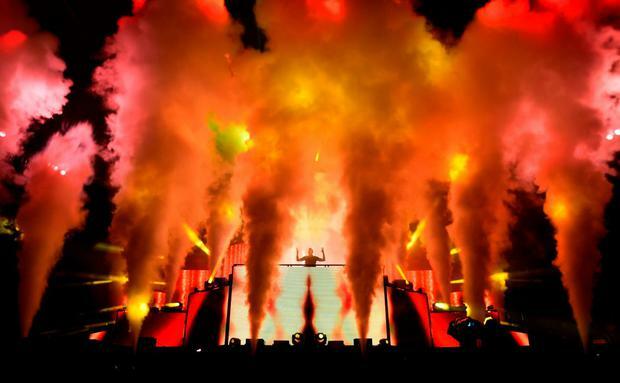 "The rise of dance music has been astronomical... I happened to be in the right place at the right time," Harris told Forbes. Harris was followed by French DJ David Guetta ($37 million), who plays in Las Vegas and Ibiza and was one of the headliners at this year's Coachella Festival in southern California. Dutch DJ Tiesto came in third with $36 million, while Americans Skrillex and Steve Aoki rounded out the Top 5, tying with $24 million apiece. Forbes estimated earnings from music, endorsements and other fields for the 12 months ending June 1, 2015 to compile the list. EDM has been one of the fastest-growing genres in music around the world and was crowned at the 2012 Grammy Awards when EDM was given its own stage at the annual music industry ceremony. Lewis Capaldi has announced a 3Arena Dublin date as part of his 2020 arena tour. Laura Harding Beyonce has released a surprise live album on the same day a documentary about her Coachella headlining show is released. Ian Begley LGBT campaigners have signed an open letter to Irish singer Sarah McTernan urging her to boycott this year’s Eurovision Song Contest in Israel.